Destiny 2's Curse of Osiris expansion included a bugged laser weapon that's so powerful it's completely ruining the balance in the competitive Crucible. So of course, Xur is selling it today. 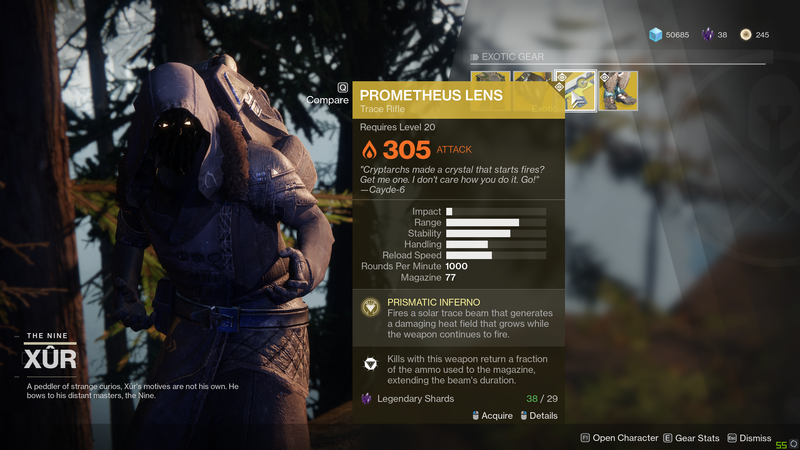 The Prometheus Lens, as it's called, is normally a random drop. That means some players have it, but others are doomed to be fried by it with no real way to fight back. Bungie has already said it's patching the hideously overpowered weapon next week, and apparently decided to balance the scales in the meantime by letting everyone have one. "Did you make a bet that we wouldn't let Xur sell Prometheus Lens?" the studio tweeted this morning, possibly in reference to Redditor JhonCensus's pledge to shave his head if Xur sold the gun. "It's available in the EDZ. Your move." Indeed, Xur is standing in his usual spot in the European Dead Zone, selling Prometheus Lens for a mere 29 legendary shards. Trials of the Nine is gonna be lit this weekend, and by "lit" I mean "literally lit on fire". Ahaha, oh man. It's gonna be like the thornpocalypse all over again but 10x worse. I gotta get in on this. the best game of D2 crucible was as a solo player (none of my team had one) playing against a full clan team all armed with them and beat them by like 30 points. Fun times. I think the real story here is Kirk only has 38 legendary shards. THIS is why I really like the Destiny devs, they really have a wicked sense of humour, if you cant get a fix out in time, you might as well just give everyone a chance to be in on the fun.